Cheesy title, but I couldn't resist; it just fit. 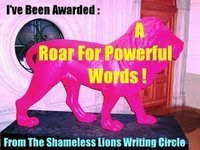 I am now supposed to give three pieces of writing advice and then pass the award on to some great writers. Obvious, yet I can't count how many people have come to me saying they "want" to write but never have gotten their behind in the chair and their hands to the keyboard. Want to write? DO IT. A lot. A good pianist can make a concerto sound effortless, but you can bet your booties that getting to that level took a lot of mundane practicing, including boring scales. Writing is the same way. To make it flow and sound natural takes work. A lot of it. I don't know of a single good writer who isn't also an avid reader. On the flip side, I do know some sad writers who declare they don't have time to read. I love how Luisa put it once: that fiction is like a language, and to learn to "speak" it, you have to be fluent. The only way to do that is immerse yourself in it regularly. 3) Be where other writers are. That means going to conferences, belonging to writing groups, joining a critique group, and networking. This is where you go from wannabe writer to real writer. Rob Wells over at the Frog Blog. One of the funniest writers around. Love his stuff. Oh, and he's a closet romance writer. Don't let him pretend otherwise. Heather, my conference co-chair and a member of my critique group, who is so good at pin-pointing flaws and finding fixes. Michele, yet another Whitney finalist (all three of these ladies are), and also a member of my critique group. I hope to have rough drafts this good when I grow up. I love reading tips from those who have gone on before me. ;) You pointed out some very good ones. THANKS! I think it's neat you received this award and are willing to share it. I look forward to reading the posts from those you bestowed this upon. All tips WELCOMED! Congrats on the award, and you gave my favorite writing advice! You must be a pro! Yay! You totally deserve it. Thanks for the linky-love!